This review is part of the Akira Kurosawa installment of LAMBs in the Director’s Chair sponsored by the Large Association of Movie Blogs. Even Akira Kurosawa could be cajoled by the studio into making a sequel. 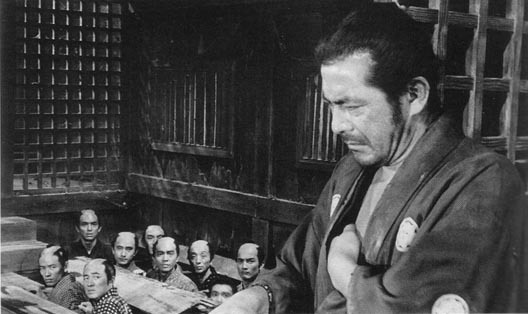 With the rampant success of Yojimbo, Toshirō Mifune’s clever ronin had to make a return; and in Sanjuro, he must keep his sword in check to unravel a plot of political intrigue within a village clan. The Yojimbo saga came about when Kurosawa was trying to adapt the story “Peaceful Days” to the screen, which was about nine young samurai who team with two ronin to set two factions against one another, rather than die fighting them. He took some of this and mingled it with Dashiell Hammett’s novel Red Harvest, which pitted his hardboiled gumshoe the Continental Op against a “bad town” with two warring kingpins, a story that has been retold a dozen times in the movies. That became Yojimbo, and Mifune’s wolfish ronin became hugely popular for using his wits and his sword to take down an entire village of corruption. He calls himself Sanjûrô, which means “30,” because he asks thirty ryo in payment for work. He was the original “Man with No Name,” and Clint Eastwood and Sergio Leone would famously adapt his story into A Fistful of Dollars and create their own beloved anti-hero. 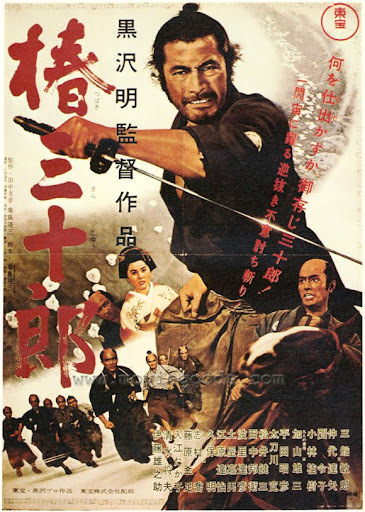 Kurosawa went back to adapt “Peaceful Days,” and took the story’s tale of internal clan intrigue and the nine young samurai who want to save their clan, but cannot hope to fight the villains within it, and replaced the two ronin with Sanjuro. He is squatting in the building they choose to meet and discuss their plans; he overhears them praise the handsome Superintendent, and side against the “horse faced” Chamberlain. Once he’s dropped enough eaves to be a co-conspirator, he emerges to share his gruff wisdom with the young hot heads. They’ve sided with the sly and handsome Superintendent and against the Chamberlain, who will accept mistreatment to avoid bloodshed; he doesn’t jive with the conceptions of honor they’ve grown up to expect. The story is less bleak than its predecessor and much less iconic, but it is still an enjoyable tale of the Edo period. It’s also enjoyable to watch Mifune and Kurosawa work with lighter material. It’s much more sentimental and even seems crafted to speak to young men who saw Yojimbo and were excited by his wits and violence! I prefer to see it as the older ronin regretting his violent past and trying to pass on some of the knowledge he’s learned to the nine, in whom he sees his reckless younger self. When he rescues the kidnapped Chamberlain’s family, the man’s wife seems amused by her situation and unafraid of the consequences. She asks him his first name, and he looks out the window and sees the camellias in bloom, so he says it is Tsubaki. 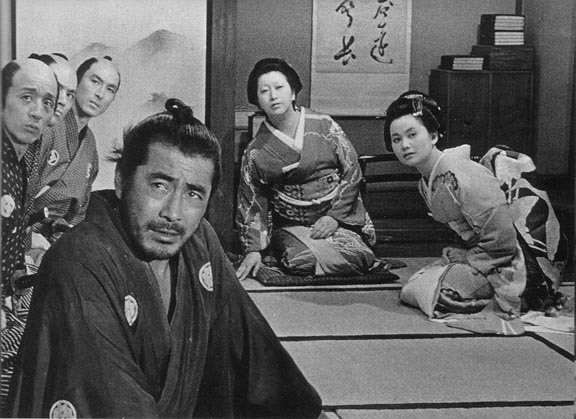 Mifune’s as-usual masterful expressions inform us that he made it up, and is embarrassed by her frankness. This character trait, the skilled killer being socially uncomfortable, would become a staple in stories of this type. Ed Harris in Appaloosa, and the “shucks, ma’am” of every cowboy. She chides him for his quick reliance on his blade, and poetically compares him to “a glittering sword. But the best swords are kept in their sheaths.” To put this in context, samurai would not use an heirloom in battle where it could be damaged; they had less ornate battle swords for that purpose. You can practically feel Sanjuro’s blush, and he promises to not kill unless he has to. But amusingly enough, the body count is actually higher than Yojimbo! Those pesky hot-headed kids keep interfering with his cunning plans and making him fight. Even though I’d seen it before, the convolutions of the plot, and how the factions play against one another to not show any public hint of corruption is quite clever and entertaining. Sanjuro meets his match with a mercenary samurai named Hanbei, who is working for the devilish Superintendent Kikui. He knows he is corrupt, and hopes to demote him to a figurehead once the conspiracy is completed. Sanjuro tricks him so many times, that we know a showdown is inevitable. Eventually the kids meddle so much that he has to slaughter an entire house of samurai and then make the kids tie him up. Stuff we’ve seen a lot since, and probably before- a Shakespeare play comes to mind, but my English major sense is failing me- but it works out as believable here. The film is relatively bloodless, the slain fall down grimacing. But the final duel with Hanbei is the one exception, because that actually means something to Sanjuro. He sees himself in Hanbei, if he were not a ronin. He doesn’t want to fight, but the man’s honor demands it. 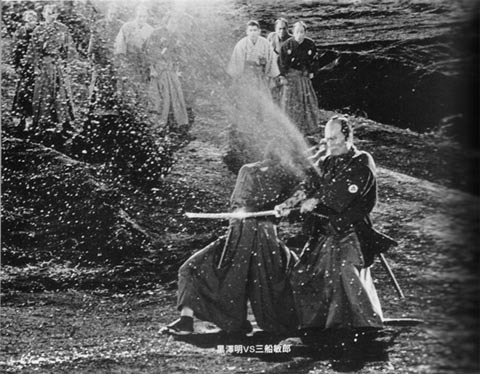 Kurosawa used a pressure hose for the explosive bloodspray, which nearly knocked the actor off his feet. It’s shocking and unexpected; we expect Hanbei to stare emptily, take his final steps, and make peace with his own honor. It’s a final wag of the finger to the young samurai and young viewers, bringing a grisly reality to the excitement we’ve had. Sanjuro says, “He was exactly like me. A naked sword. He didn’t stay in his sheath.” He admonishes the boys to “stay in their sheaths,” with all its amusing sexual connotations, and struts off down the road with his terse signature farewell. Sanjuro may not be one of Kurosawa’s groundbreaking films, but it shows that he could make a good story out of what’s essentially a moneymaking fun venture. There’s quite a bit of humor thrown in, such as the rescued Chamberlain saying “once when I was riding, someone said the rider’s face is longer than the horse’s.” But it never dips into slapstick or broad comic gestures. If anything, there’s a healthy dose of irony as bloodthirsty Sanjuro tries to use his cunning to avoid slaughter, and has his hand forced time and time again. While it may not have been as influential as The Hidden Fortress– which along with The Dam Busters became one of George Lucas’s inspirations for Star Wars– or Yojimbo, it’s a memorable and enjoyable return of the iconic ronin who gives the film its name. 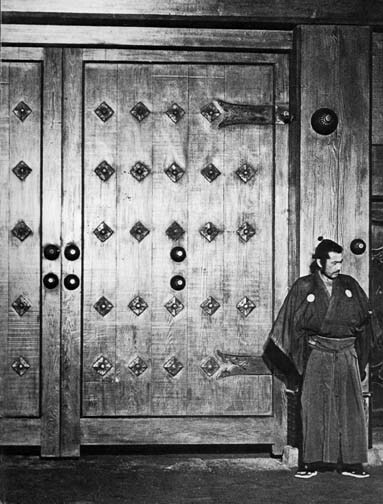 Anyone who enjoys Kurosawa’s period pictures owes it to themselves to give it its due. ← taking a rest for a while.